It was a bountiful Christmas as far as fiber related gifts received. We received a gift certificate to a not so local LYS. The store is only about 4 hours away in Asheville, NC, and we do make at least a couple of trips per year to Asheville. I imagine they'll do a phone order for us, too, if we decide to take that option. We also received cash, so that will come in handy for a fiber related goody or two! 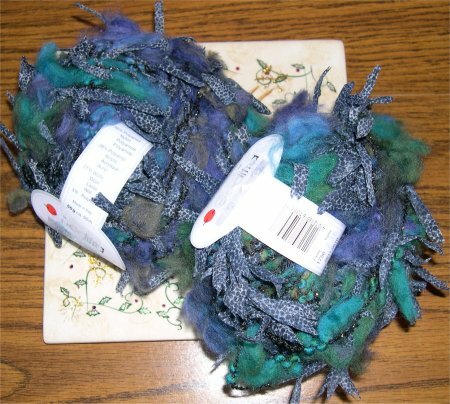 In fact, Mom instructed us to use her cash gift for fiber things, as she was too overwhelmed by it all to know what to pick! She is not a knitter or spinner herself. Here is some cool yarn given to us by a non-knitter. I like the colors a lot. This isn't a yarn I'd have chosen for myself, but I think it will be fun to knit into a scarf. It will go with my jacket, too! Here are goodies from husband and daughter. I am thrilled to now own both the Lantern Moon bee tape measure (been eyeing him for a while!) and the tiny little Clover Kacha Kacha! Husband says he'll make me a string to put through it so I can wear it around my neck. That should help keep it handy. 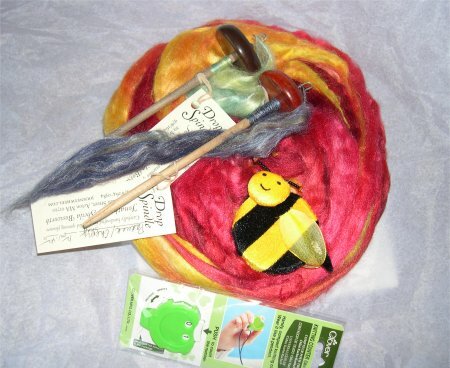 Also pictured are 4 ounces of silk roving hand dyed especially for me by husband and two Bosworth mini drop spindles. They, too, were made just for me, as husband specified the whorl and shaft woods. The spindle on the left has a walnut whorl and shaft. It is 13 ounces. The spindle on the right is 12 ounces with a paduak whorl and a cherry shaft. Aren't they gorgeous?? I also received a copy of One Skein Wonders which I'm enjoying very much and Chris Daughtry's CD. Chris was my pick for winner of American Idol, but I believe he's probably better off not having the network/record company dictate to him what his CD will be. My favorite gift came from daughter. She took art this past semester at school as an elective. Part of the curriculum was clay work. Daughter made this pitcher and gave it to me. 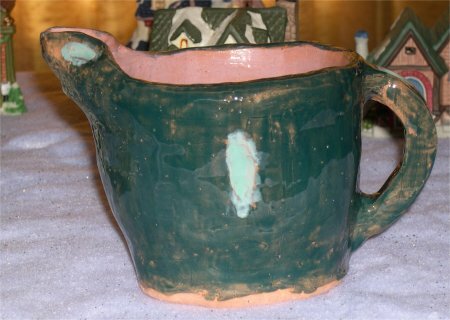 She hand sculpted it and hand painted the glaze. I'm thrilled with it. It will get a place of honor on my desk. Very nice loot. Your friends and family really know how to make you smile. Cool pitcher! I had a lot of fun when we got to that part of our art class in high school.